I love noodles and so do most Koreans. Noodles in Korean culture are symbolic of prosperity, wealth, long life, marriage and festivities. Noodles like chanchi guksu are usually eating at wedding banquets to mark the occasion. In the past, eating wheat was a luxury so it usually marked a special occasion. There are a number of really famous noodle places in Korea. These places usually have a very long history and most of them make the noodles in house. There are also a number of young upstarts that are trying to establish something new. 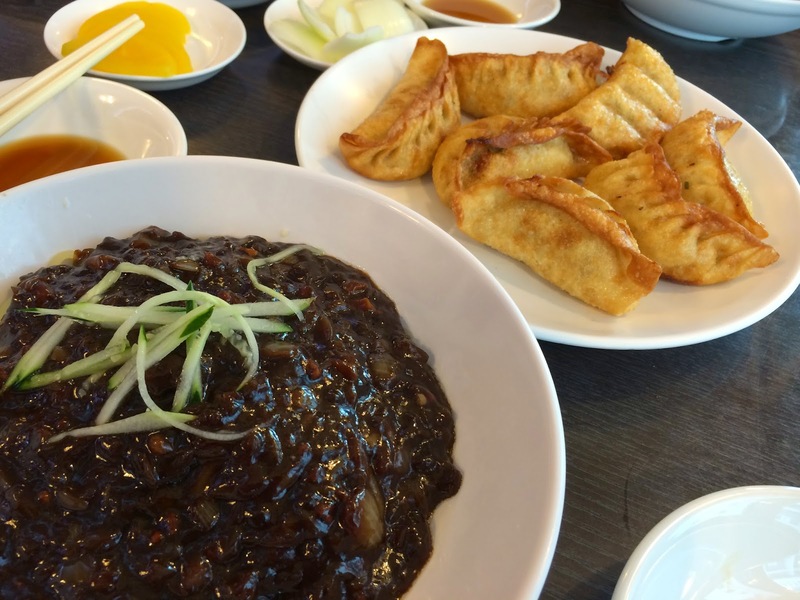 Here is my list of my favorite noodle places in Korea. Note: The list is evolving since restaurants close all the time or move in Korea. Also, my ranking may move my favorite restaurants up or down the list. Here is the link for the map! 13: Ojangdong Heungnamjip: A famous place for chewy Ojangdong-style buckwheat noodles. Their famous dish is a spicy fish buckwheat noodle dish. Their regular mul naengmyeon is good as well, but I feel the broth has a bit too much MSG, but I understand for this region it is a popular way to have it. 12: Omori Kimchi Chiggae for their Jajamyeon: Yes, this place if famous for their sour kimchi stew (mugungji kimchi chiggae) but they also do some amazing handmade blackbean noodles (jjajamyeon). The sauce is thick and full of flavor. It's actually a tad sweet, but not in a bad way. The place below does knife-cut noodles (calguksu). This place is a chain so there are a number of these places all over Korea, but the one in Chungmoro is one of the best. 11. Mijin Myeonok: This is a famous buckwheat noodle place that is on what was the old pietmatgol street (horseless street). This place does Japanese-style soba noodles in a daikon sauce. What you are supposed to do is take some broth and add a healthy dose of shredded turnip with green onions and a bit of wasabi. The noodles are well made and have a light buckwheat flavor and a bit of elasticity and chew (more so then traditional Japanese soba). I find this place to be a bit inconsistent at times though. I would recommend that you get their buckwheat noodles and their buckwheat crepes. The other things on the menu are just ok and you can get better versions elsewhere. 10. Song Ok. They do good buckwheat noodles and udong. It is very similar to Yurim Myeon. They say they have been around since 1961 which is around the same time as Yurim Myeon. The noodles here are a bit firmer yet still finely made. I like their tempura Ramen as well. There are so many and they all claim to be the original and the oldest. Some say that they are over 60 years old. 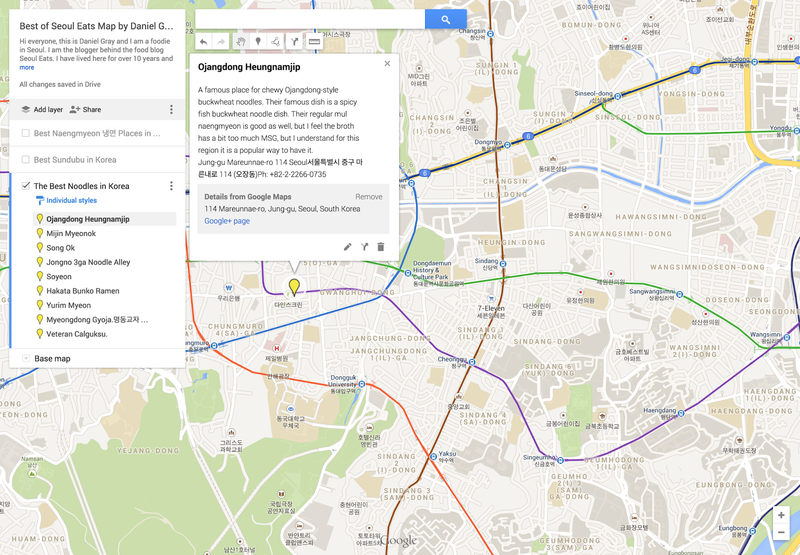 If you go out Jongno 3-ga exit 4 and cross the street and go down the alleyway, you'll hit noodle road. The first one on the left that claims to be 60 years old does an awesome clam noodles with spicy kimchi. If you go down further, you will reach some old women making noodles outside. This is Halmoni Calguksu. 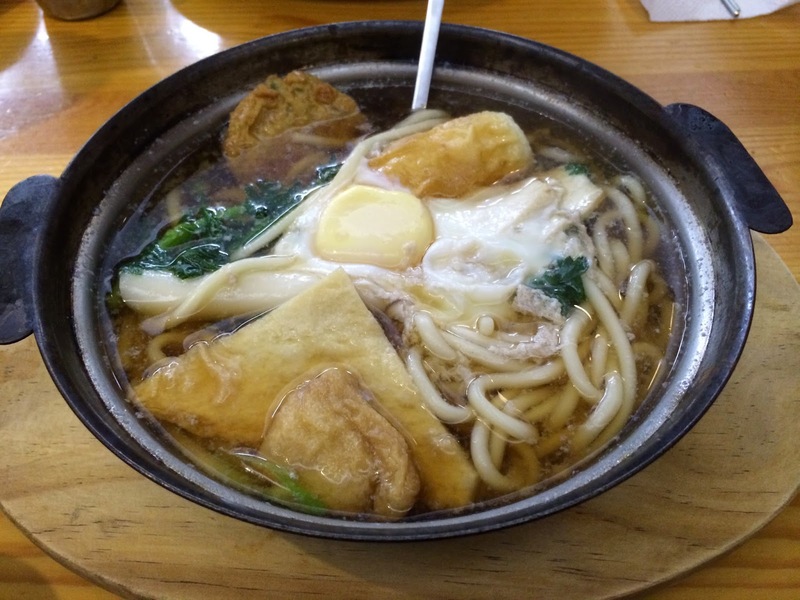 They have good noodles too, but mainly it is because it is a hearty bowl for cheap (5,000 won). There is always a line down the broth. 8. Soyeon. Simple, pure noodles that are well made. I mean it's like a luxury purse. A regular noodle place can get you full, but there is something elevated about this place. The atmosphere, the side dishes and more all refined. The Calguksu noodles are silky and the broth is very delicate. The broth seems like it may have some chicken broth in it, but they told me it is just a anchovy stock. It has a light umani hit that makes it seem like a light mist after a short run. It's one of those places I go to when I feel a bit sit and I need a subtle pick-me-up. 7. Star Jjamyeon. If I had to pick the best Jajamyeon place in Korea, then this is the place. The noodles are hand pulled and have a silky zip and body that is the perfect carrier for the hearty black bean sauce. The sauce here is carnal. It is fundamentally what jajamyeon sauce is supposed to be: warm, filling, subtle with silky hand-pulled noodles. That's it. That's all it is supposed to be. It’s none of that sweet, foofoo crap that other places call "luxury" jajamyeon. Their other Chinese food is good as well like their mapo tofu and their tangsuyok, but I am happy to stick to what they do best. 6. Hakata Bunko Ramen. One of my favorite Japanese noodle places that can hold its own against Japanese shops like Ippuddo. The taste is robust and satisfying because of the use of Korean ingredients. I love the rich, cloudy pork broth and the silky noodles. They are not the ubiquitous Japanese ramen noodles, but a Korean version that are silky and with a bit more bite. It is a better when you add some freshly ground sesame seeds and a minced clove of garlic. They have yakigyoza are quite good as well and they pair well with the noodles. 5. Pyeongchang Myeonok. This landmark restaurant is supposed to have same taste as a famous restaurant in North Korea. The noodles are silky yet with a slight chew and a comforting buckwheat aroma. It's the broth and the fixings for the soup that unites this dish. The broth is subtle and crisp that adds zip to the noodles. The pressed meat, pickles, boiled egg and slivered pears are wonderful surprises that served in perfect proportions. It is a well thought out bowl. 4. Jinju Hwegwan. This restaurant located over by city hall has been around for over 60 years and they are famous for their kongguksu: cold noodles in thick soybean milk. In summer, this dish is an amazing way to settle your stomach and to beat the heat. It is a favorite with locals for the broth is exceedingly thick, buttery and creamy compared to others. The dish is served simply with a side of kimchi and not even salt for seasoning. The absence of salt is the chef's statement that her dish is perfectly seasoned. I believe her. 3. Veteran Calguksu. This is what started out as a tiny little noodle soup in Jeonju and over the years it grew many times over. It now has a second floor, a building to the left, a huge building in the back and a large parking lot for all the cars that come there. Wow... The noodles are legit and very different from what normally constitute's calguksu. They are a rounder noodle that looks like they have been pushed through a spaghetti maker. The broth is an thick egg drop-like broth with a meaty smack. It is seasoned with wild sesame powder and some chili powder. It's one of those bowls of noodles that just makes you want to scream, "I JUST WANT YOU IN ME!" It is delicious and get some dumplings with them to complete your meal. 2. Myeongdong Gyoja. 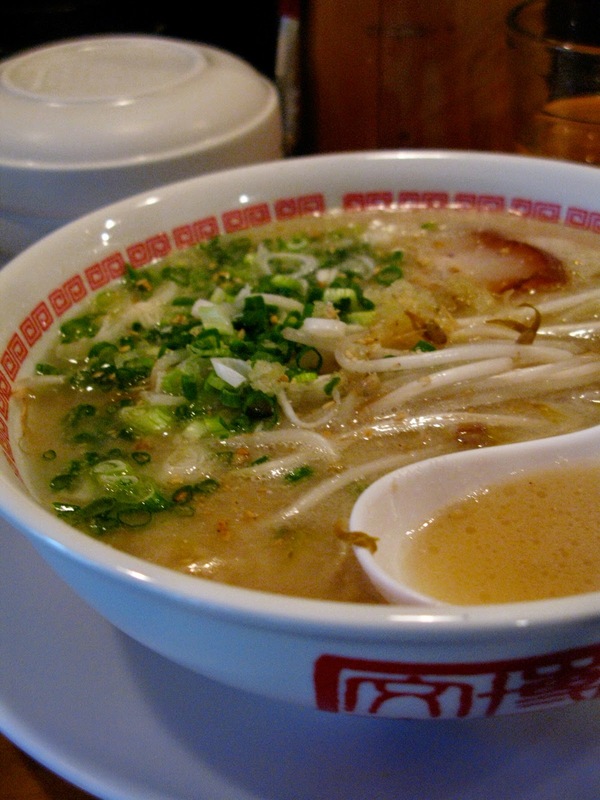 This landmark restaurant is famous for knife cut noodles in a rich broth. The fame for this place resides in the silky noodles and the rich broth. 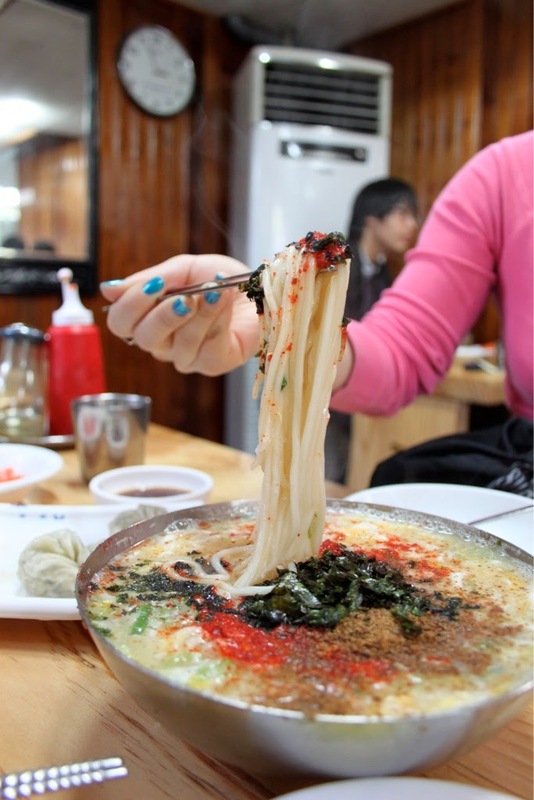 Calguksu is usually a nostalgic dish that is made with a simple clam or anchovy broth. The rich, meat-based broth for this simple dish elevates it to luxurious level plus the noodles are so silky and fine that slurping them is just fun. Plus, if you finish all your noodle and you need more, they will refill your bowl. This noodle shop also gets the award for having the spicest and garlicky kimchi in all of Korea. It will bring a tear to your eye. The mandu (or gyoza) are superb as well. They are the perfect complement to the calguksu. 1. Yurim Myeon. Recently featured in the Korean SBS Drama, "The Man from the Stars," this place has been around for over 45 years. I think the boss lady at the front register is testament to that. This is another noodle place that makes you pay before they serve you (you will find that most famous noodle places will do this). They specialize in wheat udong noodles that are uber long in a fine seafood broth that is like spring water. In the soup is their signature soft boiled egg and mugwort leaf. Their buckwheat soba noodles are also incredible; they are cut precisely with a rounded and subtle buckwheat aroma. Their mixed buckwheat noodles (bibim momil 비빔모밀) is amazing. The sauce is balanced with savory and citrusy notes: I believe there is green plum, ground pork and sesame oil (could it be wild sesame oil?) I there. It is one of the most balanced sauces I have had in Korea. Reviews: Who has the Best Kebap in Itaewon?